Create a memory a memory intensive situation where i am using 85% of available memory and SSAS is working hard to free memory. Process add a dimension and capture statistics. Review statistics, contemplate the results and then tweak something. Start at step 1 again. The other day when i did my process add I was presented with the following error. SQL Agent can be used to execute SSAS commands such as processing of a dimension and i can see that it is useful when you want to quickly schedule an adhoc processing task but there is a major drawback you need to be aware of. You are not able to specify the database to connect to and whilst you may think that it does not matter because the database is specified in the connection but it really does matter. 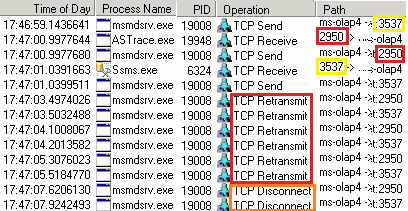 Below are extracts of a processing task from profiler which was executed using a SQLAgent task.